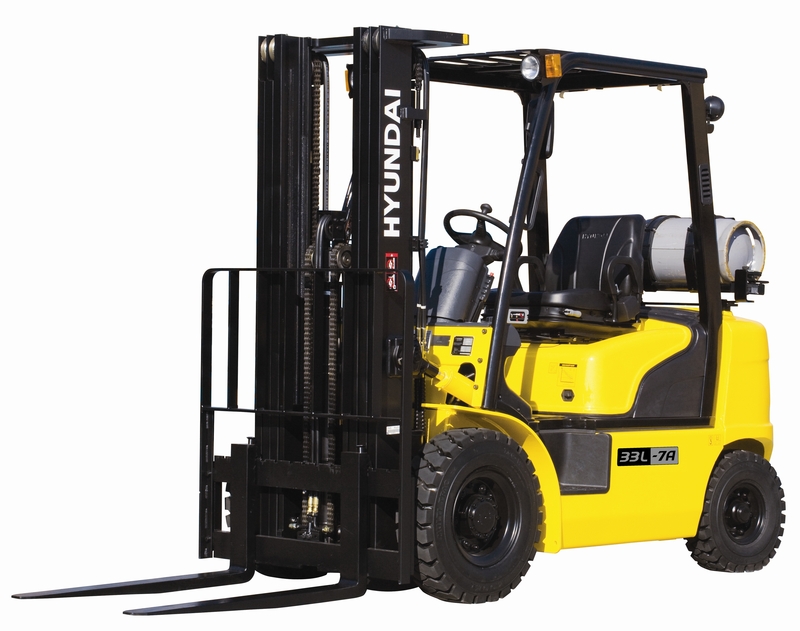 Forklift hydraulics are controlled either with levers directly manipulating the hydraulic valves, or by electrically controlled actuators, using smaller "finger" levers for control. The latter allows forklift designers more freedom in ergonomical design. Hand pallet truck - no on-board power system of any kind; the operator's muscle power is used to jack-up and move loads. 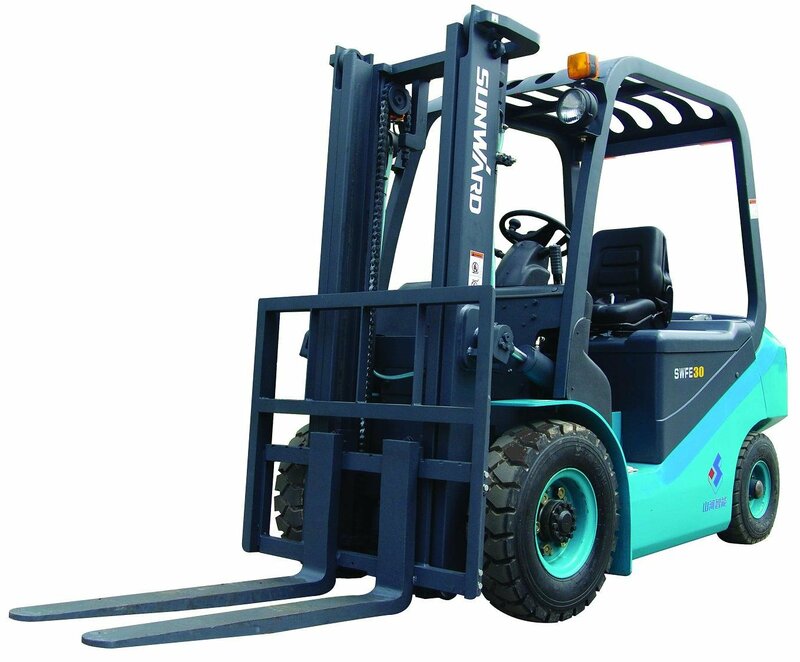 Internal Combustion Engine Powered Counterbalanced Forklift- comes in Stand on End Control, Stand on Center Control, and Sit Down Center Control, which is the most numerous. Engines may be diesel, kerosene, gasoline, natural gas, butane, or propane fueled, and may be either two stroke spark ignition, four stroke spark ignition (common), two stoke compression ignition, and four stroke compression ignition (common). North American Engines come with advanced emission control systems. Forklifts built in countries such as Iran or Russia will typically have no emission control systems. Electric forklifts - powered by lead-acid batteries, several types of forklifts are electric: cushion tire forklifts, scissor lifts, order pickers, stackers, reach trucks and pallet jacks. Electric forklifts are primarily used indoors on flat, even surfaces. Electric forklift batteries last 6 consecutive hours or throughout an 8-hour shift with 2-3 breaks. Batteries prevent the emission of harmful fumes and are recommended for facilities in food-processing and healthcare sectors. Fuel cell forklifts produce no local emissions, can work for a full 8-hour shift on a single tank of hydrogen, can be refueled in 3 minutes and have a lifetime of 8–10 years. Fuel-cell-powered forklifts are often used in refrigerated warehouses as their performance is not degraded by lower temperatures. Sideloader- comes in Stand on End Control, and Sit Down End Control, which is the most numerous. It may be electrically powered, or have an internal combustion engine. Engines may be diesel, kerosene, gasoline, natural gas, butane, or propane fueled, and may be either two stroke spark ignition, four stroke spark ignition (common), two stoke compression ignition, and four stroke compression ignition (common). North American Engines come with advanced emission control systems. Forklifts built in countries such as Iran or Russia will typically have no emission control systems. Some sideloaders have hybrid drivetrains. Telescopic handler - comes in Stand on Center Control, and Sit Down Center Control, which is the most numerous. Usually has an Internal Combustion Engine. Engines are almost always diesel, but sometimes operate on kerosene, and sometimes use propane injection as a power boost. Some old units are two stoke compression ignition, most are four stroke compression ignition (common). North American Engines come with advanced emission control systems. Forklifts built in countries like Iran or Russia will typically have no emission control systems. Some Telescopic handlers have Hybrid drivetrains. Rider Order Picking truck- commonly called an "Order Picker"; like a small Reach Truck, except the operator rides in a cage welded to the fork carriage, while wearing a specially designed safety harness to prevent falls. A special toothed grab holds the pallet to the forks. The operator hand transfers the load onto the pallet one article at a time. This is an efficient way of picking less than pallet load shipments, and is popular for use in large distribution centers. Articulated Very Narrow Aisle Counterbalanced trucks - sometimes called "Flexi or Bendi Trucks" after two of the largest manufacturers. Comes in Stand on Center Control, and Sit Down Center Control, which is the most numerous. May have an internal combustion engine or an electric motor. Electric motors are most common. Engines may be diesel, kerosene, gasoline, natural gas, butane, or propane fueled, and may be either two stroke spark ignition, four stroke spark ignition (common), two stoke compression ignition, and four stroke compression ignition (common). North American Engines come with advanced emission control systems. Forklifts built in countries such as Iran or Russia will typically have no emission control systems. Some units have hybrid drivetrains. Guided Very Narrow Aisle truck - A counterbalance type Sit Down Rider Electric Forklift fitted with a specialized mast assembly. The mast is capable of rotating 90 degrees, and the forks can then advance like on a reach mechanism, to pick full pallets. Because the forklift does not have to turn, the aisles can be exceptionally narrow, and if wire guidance is fitted in the floor of the building the machine can almost work on its own. Masts on this type of machine tend to be very high. The higher the racking that can be installed, the higher the density the storage can reach. This sort of storage system is popular in cities where land prices are really high, as by building the racking up to three times higher than normal and using these machines, it is possible to stock an incredible amount of material in what appears to be a small space. Guided Very Narrow Aisle Order Picking truck - counterbalance type Order Picking Truck similar to the Guided Very Narrow Aisle truck, except that the operator and the controls which operate the machine are in a cage welded to the mast. The operator of course wears a restraint system to protect him against falls. Otherwise the description is the same as Guided Very Narrow Aisle truck. Truck Mounted Forklift / Sod Loader - comes in Sit Down Center Control. Usually has an Internal Combustion Engine. Engines are almost always diesel, but sometimes operate on kerosene, and sometimes use propane injection as a power boost. Some old units are two stroke compression ignition, most are four stroke compression ignition (common). North American Engines come with advanced emission control systems. Forklifts built in countries such as Iran or Russia will typically have no emission control systems. The cost of a new forklift can vary between $15,000 to in excess of $150,000, dependent on the model and in particular the capacity of the forklift. 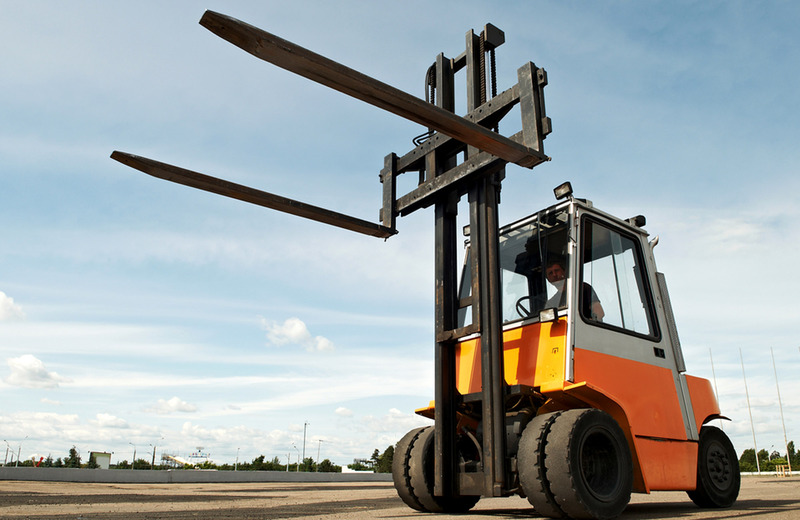 The most common forklifts are typically gas powered and have a capacity of between 2 and 2.5 tonnes. The cost of these varies from around $18,500, for some of the less well known Chinese manufactured forklifts, up to around $20,000, for the German forklifts from well established manufacturers; it is important to take into account fuel and maintenance costs when calculating the total cost of ownership. These are, unlike most lift trucks, front wheel steer, and are a hybrid VNA (Very Narrow Aisle) truck designed to be both able to offload trailers and place the load in narrow aisle racking. Increasingly these trucks are able to compete in terms of pallet storage density, lift heights and pallet throughput with Guided Very Narrow Aisle trucks, while also being capable of loading trucks, which VNA units are incapable of doing. These are rail or wire guided and available with lift heights up to 40' non-top-tied and 98' top-tied. Two forms are available; 'man-down' and 'man-riser' where the operator elevates with the load for increased visibility or for multilevel 'break bulk' order picking. This type of truck, unlike Articulated Narrow Aisle Trucks, requires a high standard of floor flatness. Omni-directional technology (such as Mecanum wheels) can allow a forklift truck to move forward, diagonally and laterally, or in any direction on a surface. Omni-directional wheel system is able to rotate the truck 360 degrees in its own footprint or strafe sideways without turning the truck cabin. One example is the Airtrax Sidewinder. This forklift truck has also made an appearance in the TV -series called 'Mythbusters'. In North America, some internal combustion powered industrial vehicles carry Underwriters Laboratories ratings that are part of UL 558. Industrial trucks that are considered "safety" carry the designations GS (Gasoline Safety) for gasoline powered, DS (Diesel Safety) for diesel powered, LPS (Liquid Propane Safety) for liquified propane or GS/LPS for a dual fuel gasoline/liquified propane powered truck. UL 558 is a two-stage Safety Standard. The basic standard, which is G, D, LP, and G/LP is what Underwriter's Laboratories considers the bare minimum required for a lift truck. This is a voluntary standard, and there is no requirement in North America at least by any Government Agency for manufacturers to meet this standard. The slightly more stringent GS, DS, LPS, and GP/LPS, or Safety standard does provide some minimal protection, however it is extremely minimal. In the past Underwriter's Laboratory offered specialty EX and DX safety certifications. If you require higher levels of protection you must contact your local Underwriter's Laboratory Office and check ask them what the correct safety standard is for your workplace. Truck frame - is the base of the machine to which the mast, axles, wheels, counterweight, overhead guard and power source are attached. The frame may have fuel and hydraulic fluid tanks constructed as part of the frame assembly. Counterweight - is a mass attached to the rear of the forklift truck frame. The purpose of the counterweight is to counterbalance the load being lifted. In an electric forklift the large lead-acid battery itself may serve as part of the counterweight. Cab - is the area that contains a seat for the operator along with the control pedals, steering wheel, levers, switches and a dashboard containing operator readouts. The cab area may be open air or enclosed but it is covered by the cage-like overhead guard assembly. When enclosed, the cab may also be equipped with a cab heater for cold climate countries along with a fan or air conditioning for hot weather. Overhead guard - is a metal roof supported by posts at each corner of the cab that helps protect the operator from any falling objects. On some forklifts, the overhead guard is an integrated part of the frame assembly. Power source - may consist of an internal combustion engine that can be powered by LP gas, CNG, gasoline or diesel fuel. Electric forklifts are powered by either a battery or fuel cells that provides power to the electric motors. The electric motors used on a forklift may be either DC or AC types. Tilt cylinders - are hydraulic cylinders that are mounted to the truck frame and the mast. The tilt cylinders pivot the mast backward or forward to assist in engaging a load. Mast - is the vertical assembly that does the work of raising and lowering the load. It is made up of interlocking rails that also provide lateral stability. The interlocking rails may either have rollers or bushings as guides. The mast is driven hydraulically, and operated by one or more hydraulic cylinders directly or using chains from the cylinder/s. It may be mounted to the front axle or the frame of the forklift. A 'container mast' variation allows the forks to raise a few meters without increasing the total height of the forklift. This is useful when double-loading pallets into a container or under a mezzanine floor. Carriage - is the component to which the forks or other attachments mount. It is mounted into and moves up and down the mast rails by means of chains or by being directly attached to the hydraulic cylinder. Like the mast, the carriage may have either rollers or bushings to guide it in the interlocking mast rails. Load back rest - is a rack-like extension that is either bolted or welded to the carriage in order to prevent the load from shifting backward when the carriage is lifted to full height. Attachments - may consists of a mechanism which is attached to the carriage, either permanently or temporarily, to help in proper engagement of the load. A variety of material handling attachments are available. Some attachments include sideshifters, slipsheet attachments, carton clamps, multipurpose clamps, rotators, fork positioners, carpet poles, pole handlers, container handlers and roll clamps. Tires - either solid for indoor use, or pneumatic for outside use. Drum handler attachment - is a mechanical attachment that slides onto the tines (forks). It usually has a spring-loaded jaw that grips the top lip edge of a drum for transport. Another type grabs around the drum in a manner similar to the roll or barrel attachments. Man basket - a lift platform that slides onto the tines (forks) and is meant for hoisting workers. The man basket has railings to keep the person from falling and brackets for attaching a safety harness. Also, a strap or chain is used to attach the man basket to the carriage of the forklift. Single-double forks - are forks that in the closed position allow movement of a single pallet or platform but when separated, turn into a set of double forks that allow carryin two pallets side by side. The fork control may have to replace the side-shifter on some lift trucks.